A recent article by Pomona College finance professor Gary Smith has me thinking about stocks to buy over $200. Smith’s opinion piece appeared on MarketWatch July 2; using three valuation models to make his case, he argued why Apple (NASDAQ:AAPL) is still a buy at $200. Admittedly, AAPL is not quite there yet, trading around $187 as a write this, but close enough. A well-written and mathematically sound valuation of Apple stock, Smith concluded that if you buy at $200 and hold for ten years time, you’ll be happy you did. I’m not suggesting for a minute that buying stocks trading over $200 are the key to your financial future, but they are often this high because of strong economic underpinnings. Take Amazon (NASDAQ:AMZN), for example. It crossed $200 in March 2012. If you’d bought 100 shares back then, today you’d have an annualized total return of 41% in the six-and-a-quarter years since and, more importantly, a profit of $151,257. Out of all of the S&P 500 stocks, 52 trade at $200 or more. Here are my seven stocks — one from seven different sectors — to buy over $200. Sherwin-Williams (NYSE:SHW) is my pick from the basic materials sector. Down 0.40% year-to-date, it has some work to do if it wants to finish 2018 up double digits, something it has done five times in the past decade. The global paint business was recently in the news, but not in a good way. Three people, including an analyst with S&P Global were charged with insider trading related to its 2016 purchase of Valspar. It seems the analyst allegedly tipped off two friends of the impending announcement netting them $300,000 on Valspar stock. While that’s not Sherwin-Williams’ fault, it’s never good to have your company associated with this kind of profiteering. The company’s Q1 2018 results paint a picture of a very strong global paint and coatings business that saw revenues grow 6.9% during the quarter to $4.0 billion generating $2.89-per-share in profits with expectations in fiscal 2018 of a minimum $16.05-per-share in earnings. In the case of Sherwin-Williams combining with Valspar, one plus one equals three. Do you like booze? Enjoy knocking back a few from time to time? Then hop on board Diageo (NYSE:DEO). We know for a fact there will always be some baseline demand for alcohol. No matter how healthy people claim they want to be, they will always give in to alcohol. You know many of Diageo’s brands, including Johnnie Walker, Crown Royal, J&B, Buchanan’s and Windsor whiskies, Smirnoff, Cîroc and Ketel One vodkas, Captain Morgan, Baileys, Don Julio, Tanqueray and Guinness. Why is alcohol a smart investment? Because it is a social product. When people get together, if one person buys, others tend to buy also. Marketing for alcohol centers around creating an experience, and creating and perpetuating social circles. In general, it is a good play because human social behavior is often centered around the consumption of alcohol. DEO stock is being pushed higher thanks to increased efforts in flavored alcohols. The company is consistent and reliable, and pumps out more than $3 billion annually in free cash flow, returning about half of that to shareholders in the form of its 2.4% yield. United Natural Foods sells organic, natural and specialty foods to groceries in the U.S. Of course, the company, which sells a significant amount of products to Whole Foods, will benefit if that chain becomes much more popular. Like Sprouts, United Natural Foods should be boosted by food inflation and by increased demand for healthier food. It’s looking to further exploit the latter trend by increasing its exposure to fresh food and growing its e-commerce business, the company said on its fiscal third quarter results conference call on June 6. Importantly, United Natural Foods also reported that it’s outpacing the growth of the organic foods sector. Indeed, the company’s net sales jumped 12% year-over-year in the third quarter, while its net operating income soared 42% versus the same period a year earlier. Despite the impressive growth, United Natural Foods stock has an anemic valuation. United Natural Foods stock is trading at a forward price-to-earnings ratio of just 12, and its price-to-sales ratio is a tiny 0.22. After the company reported its third-quarter results, multiple analysts complained about its margins. Last quarter, its gross margin came in at 15.4%. I believe that, going forward, a combination of higher food inflation, supply chain improvements, and greater scale will meaningfully boost United Natural’s margins. Meanwhile, as Wall Street becomes much more enthusiastic about the organic food category, the multiples of UNFI stock should rise significantly. Boeing (NYSE:BA) is my pick from the Industrial Goods sector. Up 15% YTD compared to 4% for its aerospace and defense peers, it has managed to deliver an annualized total return of 17% over the past 15 years, 210 basis points greater than its peers. On July 2, the Brazilian news media reported that Boeing and Embraer (NYSE:ERJ) would submit the contracts bringing Embraer’s commercial aviation division together with Boeing’s commercial aviation business to the Brazilian government for its blessing. Upon approval and completion, Boeing would control the operation, one that should compete more effectively against the Airbus (OTCMKTS:EADSY), Bombardier (OTCMKTS:BDRBF) tie-up with the C-Series jet. The year is going well for Boeing despite the China tariff headwinds threatening its most significant growth market — Boeing will sell $1 trillion of its planes to China over the next 20 years — and bringing Embraer under its fold puts a cherry on top of the sundae. There might be some turbulence for Boeing stock over the next 12 months; I would take any retreat of its stock price as an opportunity to buy at a better price. Boeing’s currently operating at maximum efficiency and should be able to keep it up despite the storm clouds in China. This entry was posted in Financial Stocks and tagged BA, DEO, SHW, UNFI on July 5, 2018 by admin. With trade war fears plaguing the market, Chinese stocks have been receiving some bad rap recently. But don’t let this distract you. The top China-based stocks present stellar investing opportunities. And you don’t just have to take my word for it. Here we use TipRanks to pinpoint the best Chinese stocks according to the Street. This website tracks the latest ratings from over 4,800 analysts — so we can find the most highly-rated stocks with just a couple of clicks. If you think about it, the restrictions on foreign companies means a whole host of Chinese-equivalent U.S. stocks has sprung up. From WhatsApp to Google, China has its own parallel universe of top-notch companies. The best part is that these stocks appear seriously undervalued. It’s true that it’s much easier to invest in a company whose products you know and use. But for the more adventurous investor, these stocks have huge potential. SVB Financial Group (NASDAQ:SIVB) is my pick from the financial sector. Up 25% YTD, it’s on a seven-year winning streak that doesn’t look to be broken anytime soon. If you can only own one bank, I wholeheartedly suggest you hold SVB Financial, the holding company for Silicon Valley Bank, consistently named one of the 100 best banks in America. Silicon Valley Bank got its start lending money to tech startups and has since broadened its base to include innovators and entrepreneurs outside the technology sector with a loan portfolio nearing $25 billion. Innovation is a big reason I called SIVB in 2013 one of the five best stocks to own for the next 20 years. Up 192% since then, I believe it’s just getting started. Equinix (NASDAQ:EQIX) is my pick from the technology sector. Down 5% YTD, it’s not even keeping up with its diversified REIT peers. However, anyone who has owned EQIX over the past five years — 21% annualized total return — has significantly benefited from the data center buildout that has been going on to support the growing cloud. In March, InvestorPlace contributor and Finbox.io founder, Matt Hogan, discussed the six most inexpensive growth stocks to buy; Equinix was on his list. At the time, Finbox.io had a fair value of $444, providing investors with 7% upside. Now trading around $428, Finbox.io suggests it has 22% upside or fair value of $520. With the public cloud computing market expected to grow by 22% in 2018 to $178 billion, the company’s data centers will continue to experience strong demand. As long as Amazon and the rest of the major cloud participants continue to grow, so too will Equinix. As China’s No. 1 search engine, Baidu Inc (NASDAQ:BIDU) is often nicknamed the ‘Google of China.’ Like Google, Baidu’s business interests span much more than just search. Baidu’s business covers the cloud, AI, maps, IT security and self-driving technology. The latest update: Baidu has announced a new partnership with Ford Motor (NYSE:F) to develop smarter cars for the Chinese market. And from a Street perspective, Baidu certainly gets the thumbs up. The stock has 100% support from top analysts specifically and a $306 price target (26% upside potential). Top Oppenheimer analyst Jason Helfstein has just reiterated his BIDU Buy rating. The “current valuation is too low for the leading Chinese search engine” argues Helfstein. He points out that BIDU is in prime place to benefit from the secular growth of China’s online ad market. You certainly know the name GlaxoSmithKline (NYSE:GSK). As investors, we aren’t going to freak out about a U.K.-based company, right? We also know it is an $100 billion pharmaceutical company. It has four divisions: Pharmaceuticals, Pharmaceuticals R&D, Vaccines and Consumer Healthcare. Besides its huge portfolio of proprietary pharma drugs, it has other products you certain know: Otrivin, Panadol, parodontax, Poligrip, Sensodyne, Theraflu and Voltaren. It also has consumer products, such as drinks and foods, toothpastes, toothbrushes, mouth rinses, medicated mouthwashes, gels and sprays, denture adhesives, and denture cleansers. GSK invented NicoDerm and has more than three dozen other products in development. It’s no wonder GSK has billions of cash on the balance sheet, and more than enough cash flow to pay its dividend, presently at 5.4%. Chinese e-commerce giant Alibaba Group Holding (NYSE:BABA) is always one of the Street’s favorite stock picks. And this doesn’t appear to be changing any time soon. On the contrary; our data shows that in the last three months 15 analysts have published BABA Buy ratings. Couple this with a bullish $248 price target (34% upside potential) and you can see why BABA is a hot stock pick right now. But this huge sales potential still isn’t reflected in current prices: “We believe that BABA’s growth prospects are accelerating more rapidly than the share price, creating a favorable entry point. The shares also appear attractively valued. Based on peer group, historical comparables analysis, and discounted free cash flow valuation, we believe the BABA shares are attractive up to $330 and beyond.” We’re sold! This entry was posted in Financial Stocks and tagged BABA, BIDU, EQIX, GSK, SIVB on July 5, 2018 by admin. While the tech-heavy Nasdaq 100 is up 24% over the past year, it’s only up 3.7% year to date. Sure, it’s outperforming the S&P 500 in 2018, but when you look at the chart, you can see it hasn’t been a steady journey by any means. Volatility is back, and given the state of affairs in Washington and some of the things going on around the world, volatility is likely to increase rather than decrease in coming months. What’s more, the beloved tech sector is going through its own changes. Everything from major chip companies to up-and-coming cloud companies are getting their comeuppance after a couple years of strong growth. So, in a time of rising risk, I thought it would be a good idea to share with you tech stocks that aren’t worth the risk, especially right now. Most of these firms are on the smaller end of the tech sector and while they have potential, now isn’t the time to be looking for them to make a run to greatness. This entry was posted in Financial Stocks on July 1, 2018 by admin. Finding dividend stocks that provide the right amount of growth, long-term stability, and consistent yields can be difficult. But they aren’t impossible to find, if you know where to look. To help you track down a few of these companies for your portfolio, we reached out to some Motley Fool contributors for dividend stock ideas. They came back with these stocks. Here’s why. 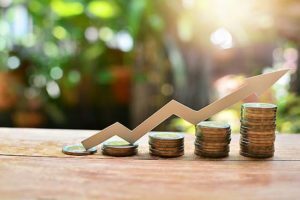 Cara Therapeutics (NASDAQ:CARA) had its price target lifted by HC Wainwright from $24.00 to $26.00 in a research report sent to investors on Thursday, Marketbeat.com reports. They currently have a buy rating on the biopharmaceutical company’s stock. Other equities research analysts also recently issued reports about the stock. Seaport Global Securities reiterated a buy rating on shares of Cara Therapeutics in a report on Friday, March 16th. Laidlaw set a $26.00 price target on shares of Cara Therapeutics and gave the stock a buy rating in a report on Thursday, May 24th. Stifel Nicolaus lifted their price target on shares of Cara Therapeutics to $20.00 and gave the stock a buy rating in a report on Wednesday, May 23rd. Needham & Company LLC lifted their price target on shares of Cara Therapeutics from $23.00 to $28.00 and gave the stock a buy rating in a report on Wednesday. Finally, BidaskClub downgraded shares of Cara Therapeutics from a hold rating to a sell rating in a report on Tuesday, March 20th. One equities research analyst has rated the stock with a sell rating, four have issued a hold rating, ten have assigned a buy rating and one has given a strong buy rating to the stock. The stock currently has an average rating of Buy and a consensus price target of $24.63. 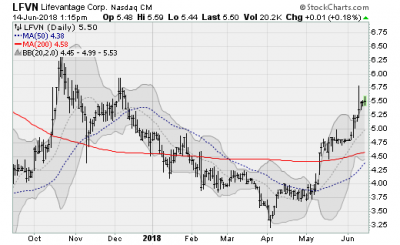 LifeVantage Corp (NASDAQ:LFVN) shares have rallied nearly 70% from the lows seen in April to challenge the highs seen late last year. The company develops nutritional supplements and skin care products such as LifeVantage TrueScience (an anti-aging skin product) and Axio energy drink all appealing to “biohackers” trying to take maximum control over their body and health. All on a monthly recurring payment plan. With wages poised to push higher, consumers will have extra cash to burn on luxuries like non-FDA approved supplements and cremes. This entry was posted in Financial Stocks and tagged CARA, LFVN on July 1, 2018 by admin.